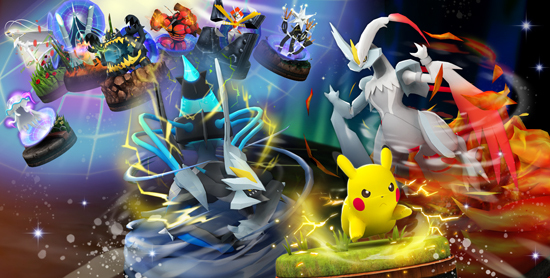 A major update is now available for Pokémon Duel, the mobile strategy game in which fans battle each other with digital Pokémon figures. This update introduces the ability for Pokémon to change forms, new Legendary Pokémon, and much more. Pokémon Duel is available for download at no charge on the App Store, Amazon Appstore for Android, and on Google Play. The ability for Pokémon to change forms! Certain Pokémon will now be able to change their forms during battle. As well, players can get rare items and a ticket good for a Booster 6-pack guaranteed to include at least one [EX] or higher rarity figure just for logging in. Note that log-in bonuses will be available only for a limited time. As part of Pokémon’s legendary year, the Legendary Pokémon Kyurem is now available, and in the right deck it’ll be able to change its form. Both Black Kyurem and White Kyurem, which have drawn their power from the Legendary Pokémon Reshiram and Zekrom, have also been introduced with this update. 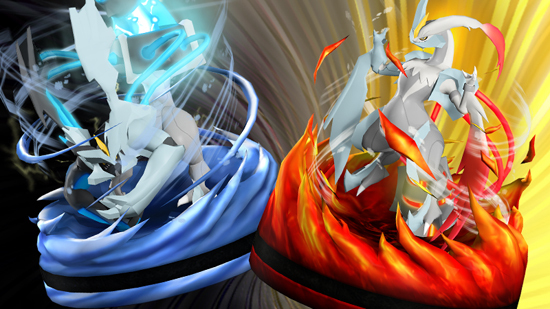 Trainers will also need the new DNA Splicers plate to help Kyurem change its form. All three Pokémon are available in the April 2018 Recommended Booster A and the April 2018 Booster 10-pack A. A new social feature introduces the ability to follow other players and track their progress in-game. Pokémon Duel fans can receive special items if they follow enough players, and can earn extra items if enough players follow them back. Players should take note of the strongest decks they see their friends use, because they'll need to be on top of their game with the upcoming tournament feature. A pre-tournament will be held soon to preview this long-awaited feature. Future tournaments will be held in various formats, so players should make sure to build a wide collection of Pokémon figures and plates.